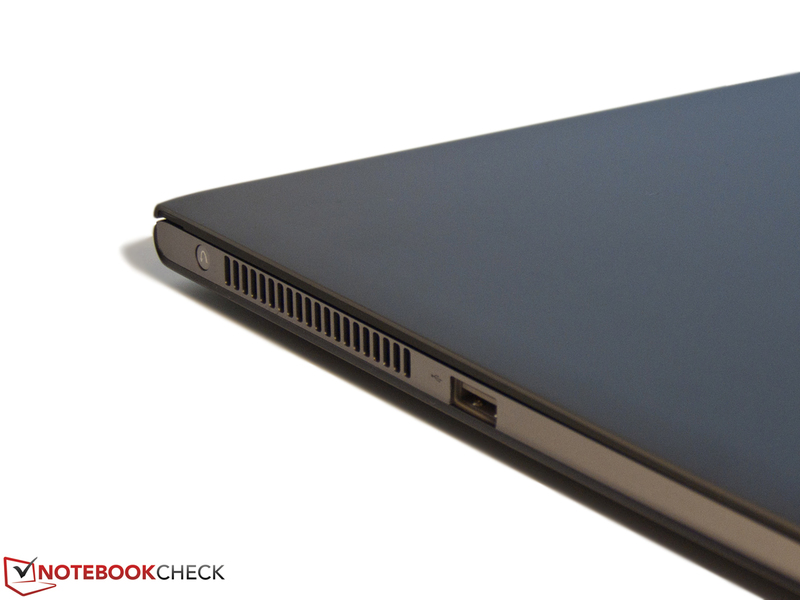 After we reviewed various UltraBooks from Asus and Acer, the next manufacturer, Lenovo, now takes up the challenge for the title of ultra thin devices. Alike the Zenbook UX31 and the Aspire S3, the 13.3 inch IdeaPad U300s wants to smack down the leader, Apple and its successful MacBook Air. In the tested configuration, the buyer gets a Core i5-2467M, 4 gigabytes of RAM and a 128 GB SSD for just under 1000€. Buyers who want the faster Core i7-2677M and twice as much memory capacity, so 256 gigabyte, will have to invest a steep surcharge of 400€ for the top model of the series. Thus, the U300s almost reaches the price level of a similarly equipped MacBook Air. The interested buyer may first think: A lot of money for such a small notebook. 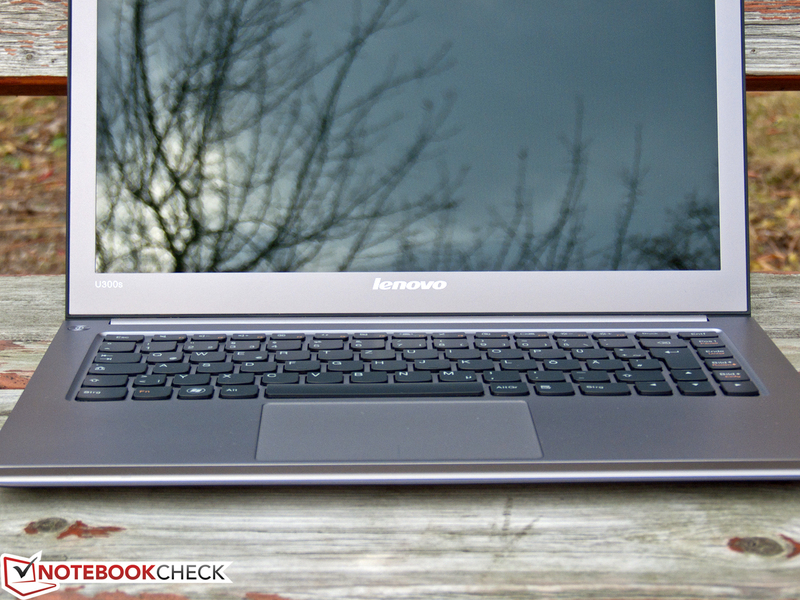 We now want to find out in our review, if the IdeaPad nevertheless can earn itself a purchase recommendation. Those who hold an UltraBook, like the IdeaPad U300, in their hands for the first time, will be very impressed by the slim build and low weight. Lenovo has accomplished reducing the already extremely slim contenders from Asus, Acer and Apple even more and builds a notebook of just 14.9 millimeters. The weight of 1.33 kilograms is even lower than some netbooks, and predestines the U300s for mobile use. 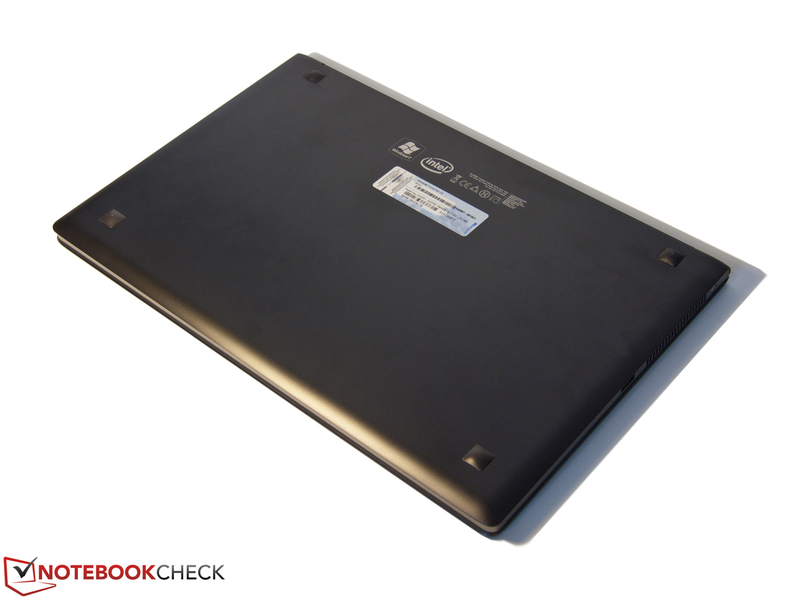 Alike the Zenbook UX31, the case of the U300 is made of a single block of aluminum. The manufacturing of edges and material transitions is first rate and doesn't give reason for complaint even in detail. The feel of the brushed inside of the display and case and the smooth surfaces of the bottom and rear make just as a high-end impression and are absolutely appropriate for this price range. Unfortunately, we noticed that Lenovo had to make compromises on stability in favor of a minimum thickness, especially in view of the display. While the case can still counter selective pressure quite well, the only approximately 3 millimeter screen proves to be susceptible to warping. Thanks to the smooth-running hinges, the device can be opened single-handedly without having to hold down the base unit. However, the display tends to wobble intensely; it takes a few seconds before it comes to standstill when it's been nudged. This problem could intensify should the hinges loosen in the course of the notebook's life. Owing to the impressive manufacturing quality, the U300s can score a good rating for its case anyway. At a build thickness of less than 15 millimeters, a few drawbacks have to be accepted in stability. This isn't an issue in the thicker Asus Zenbook UX31. It's ultimately up to the buyer if the elegant design can compensate this shortcoming. The slim UltraBooks aren't connectivity miracles and the U300 isn't an exception, either. Two USB ports, one of which is a cutting edge USB 3.0 standard, are on a par with Asus and Samsung. The lower-priced Aspire S3 and the MacBook Air only have USB 2.0, but Apple has compensated this drawback by integrating the new Thunderbolt interface. An HDMI out is available for connecting external monitors. The buyer doesn't get VGA or a DisplayPort. While DisplayPort is compatible with HDMI, and can easily be changed with an adapter, the lack of a VGA out is more problematic. Consequently, the only alternative for connecting an older projector is purchasing a fairly expensive active signal converter. Audio signals can be transmitted via the combined headphone/microphone jack besides HDMI. Therewith, the list of existing features is finished. A LAN port? Card reader? eSATA or docking station connector? We regrettably couldn't find any of these or other interfaces. Lenovo had to distribute all interfaces on the case's sides because of the U300s' display design. It covers the entire rear of the notebook's case in an opened state. This solution won't be very satisfying when the U300s is mainly in stationary use. 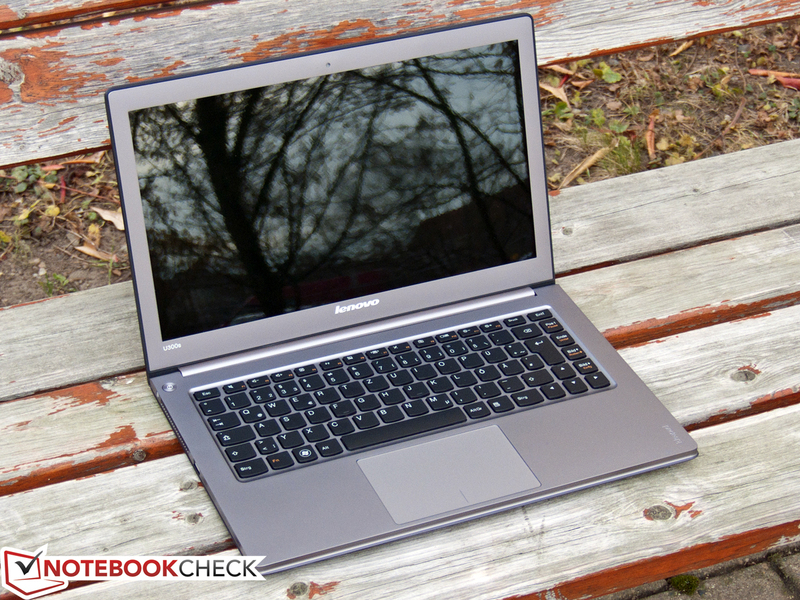 In our opinion, small UltraBooks are classic secondary devices mainly made for mobile use. All interfaces are also easy to accessible and are spaced far enough to not obstruct each other even when protruding plugs are used. The U300s has the usual fare of communication options. An Intel Centrino Wireless N 1030 adapter takes care of connecting to WLAN networks in standard 802.11 b/g/n and also includes Bluetooth version 3.0. 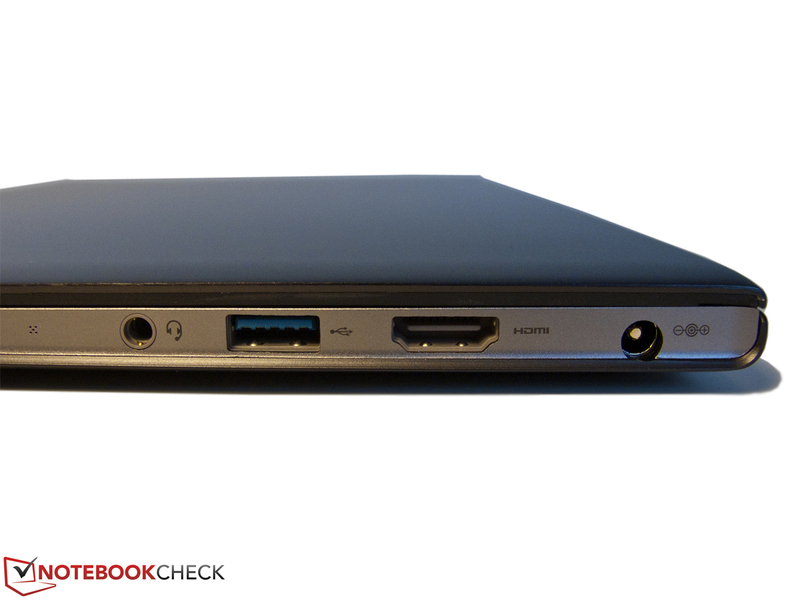 We would have welcomed a built-in UMTS module for mobile Internet access in an UltraBook made for high mobility. But Lenovo unfortunately doesn't provide this in the U300s. The manufacturer could however surprise us with one feature: Image and audio signals can be transmitted wirelessly to a TV thanks to the Intel Wireless Display Technology support, providing there is a corresponding receiver (starts at about 50€). Despite a few restrictions and teething problems of this technology, WiDi is an interesting feature which hardly another notebook has in this price range. 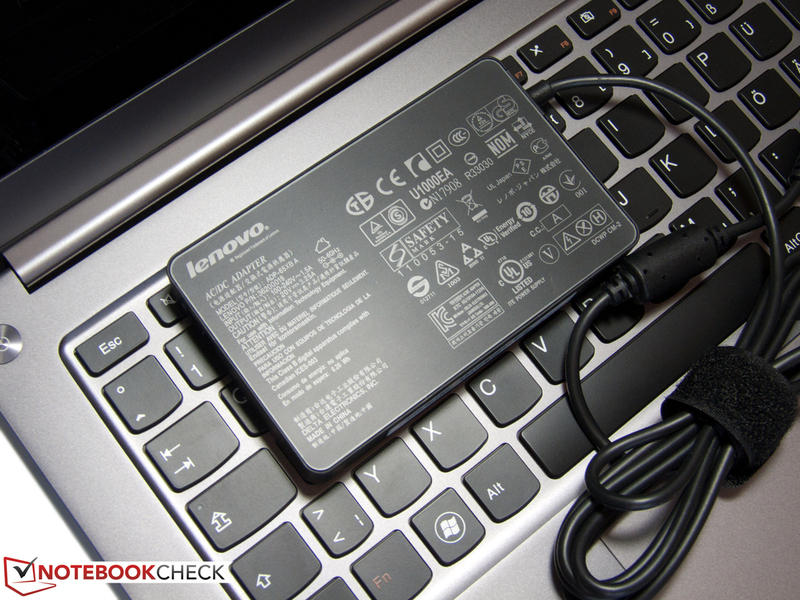 Apart from the notebook and a compact 65 watt power adapter, Lenovo has barely included any accessories. We find a quick start guide, a brief manual and the warranty conditions in the stylish black box. 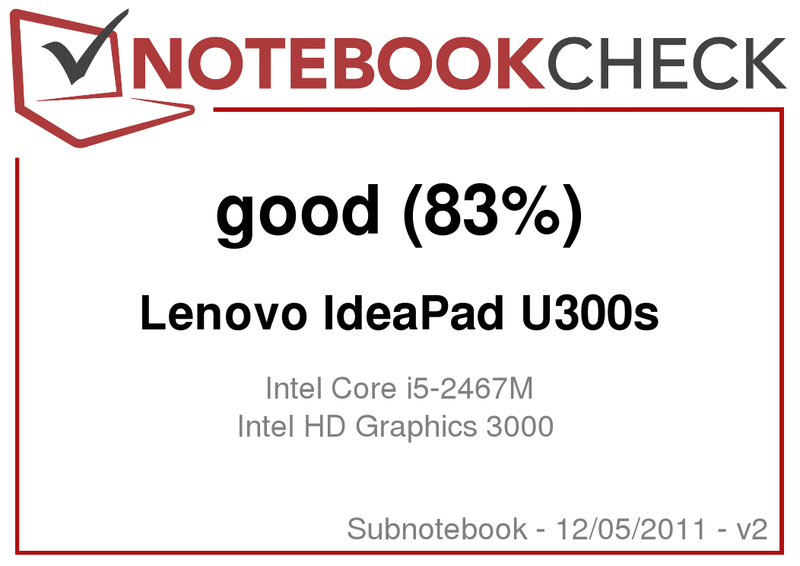 The IdeaPad U300s is advertised with only a short 12 month warranty ex-factory. An enclosed, nondescript flyer informs us that our test device from the retail market has an extended warranty of two years. We can't say if this applies to every U300s, though. Beyond that, it's possible to check if more warranty extensions are available by means of the serial number at Lenovo. At any rate, a 3 year warranty extension is possible at a fair price of just under 80€. The slightly lowered chiclet keyboard is fitted perfectly into the aluminum case of the U300s. The approx. 15 millimeter wide letter keys are beveled at the lower side and have a smooth as well as even surface. The used plastic has a high quality feel and the stability also convinces. The keyboard can score with its pleasantly standard-compliant layout, with exception of the F1-F12 keys that can only be enabled via FN. Regrettably, the typing feel remains to be a bit contradictory even after longer familiarization. The wide key gaps and the lack of a concavity on the letter keys reduce the accuracy and thus also the typing speed in comparison to a classic keyboard. The U300s hardly differs from its contenders in this point. The key drop is fairly short, but has a precise and firm pressure point. The keyboard's quiet typing noise doesn't get disturbing even in quieter surroundings. 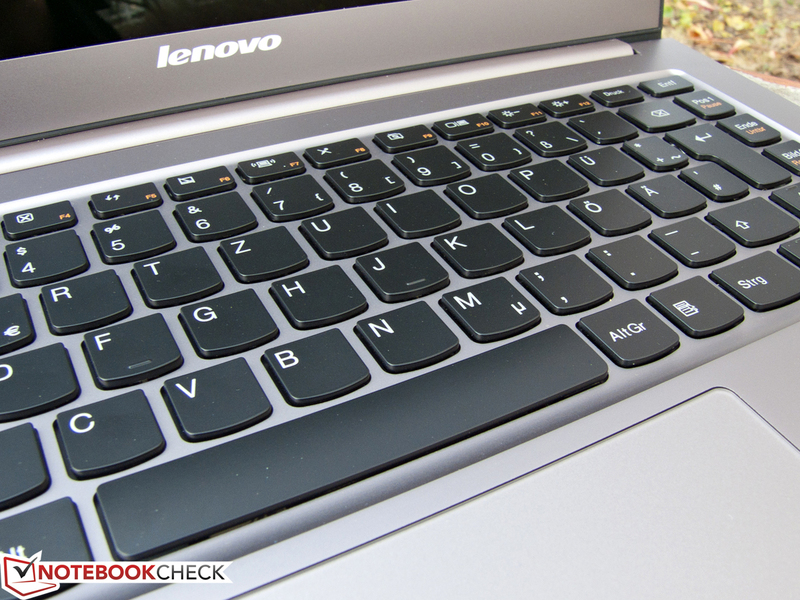 Handy: Lenovo has given the arrow keys a small mark so that they are also palpable without looking. However, an additional keyboard light would have been even better, as it is installed for example in the current MacBook Air. The U300s has a very generously sized touchpad for the 13.3 inch category. 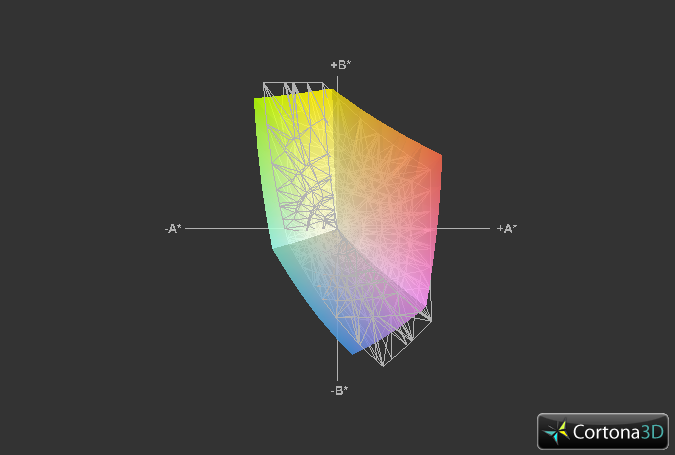 Its surface area of 10.5 x 7 centimeters is very similar to that of the UX31. The fingers glide with agreeable ease over the surface and can control the mouse cursor precisely. However, we noticed a slightly delayed implementation of movement adversely. Multitouch gestures, such as zooming on a website, are supported and worked flawlessly in the test. We found the scroll function, which is enabled by swiping two fingers in the desired direction, very practical. The otherwise usual search for a special scroll area at the touchpad's right edge is no longer necessary. The mouse keys are installed below the pad's area. 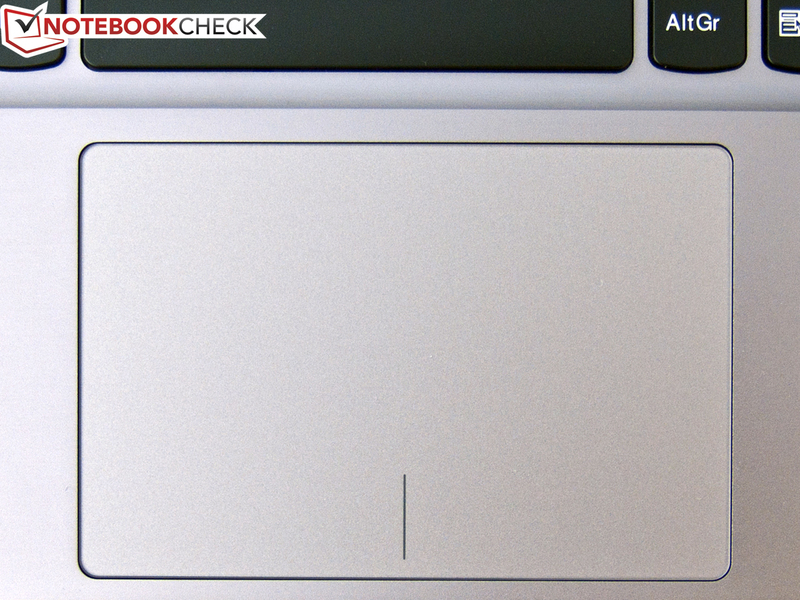 Both the left and right key have a clear pressure point and a full, but not too loud, click noise. It's unfavorable that the pad is touch-sensitive up to the keys. This frequently results in moving the mouse cursor unintentionally and thus missing the targeted object. 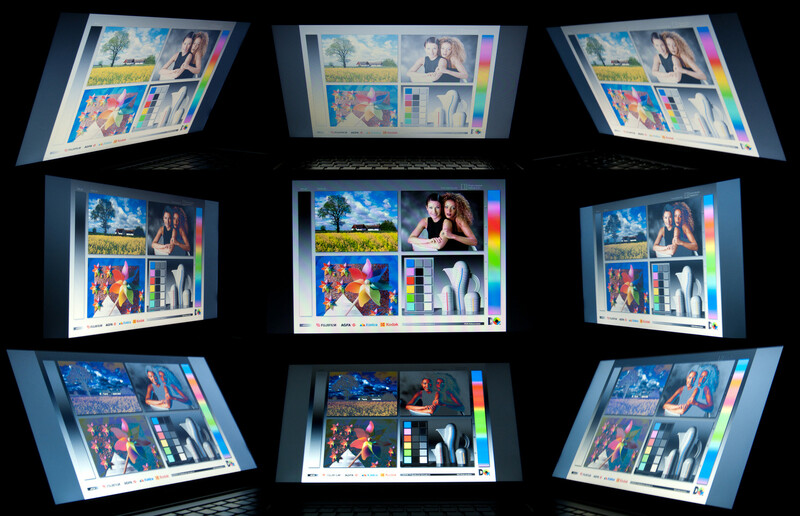 With a resolution of 1366x768 pixels, the 13.3 inch screen of the U300s is only on the level of an Acer Aspire S3 or Samsung 900X3A. It doesn't come close to that of MacBook Air 13" (1440x900) or even the Asus Zenbook UX31 (1600x900). The resulting pixel density of 118 dpi provides a pleasant font size, but we would have appreciated a finer depiction and a larger desktop. 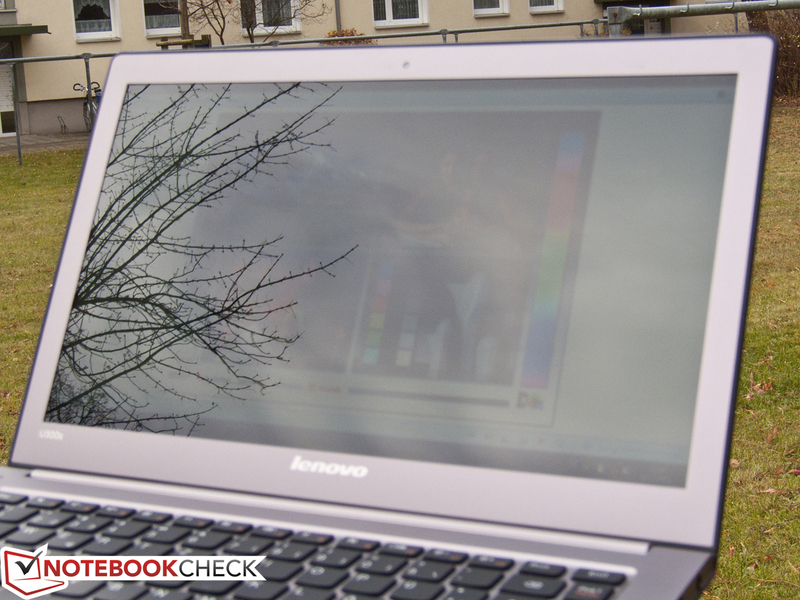 Lenovo specifies a modest display brightness of 200 cd/m2 for the U300s. But not even the LED backlight of our test device could achieve this rate. We only measured an average of 170.2 cd/m2, which are distributed quite evenly over the reflective screen. The Asus and Samsung contenders both achieve a rate of over 400 cd/m2, and even the lower-priced UltraBook from Acer was a bit brighter. The black value is high 1.16 cd/m2 and results thus in a weak contrast of 152:1. The TN screen from the manufacturer, CMO, can't reach the standards of high quality screens, as found in the MacBook Air or the 900X3A, either. Black is reproduced with a light gray cast and the backlight's maximum level also has to often be set indoors. The color spectrum of the U300s is about as restricted as the other previously reviewed UltraBooks. Neither AdobeRGB nor sRGB are completely covered, which is only important for special application fields, such as professional image editing. The reflective surface nevertheless feigns a strong and vivid color reproduction in practical use. A weak brightness together with a reflective screen isn't exactly the perfect requirements for outdoor use. As feared, the U300s unfortunately fails in this scenario completely. The legibility of displayed contents already suffers extremely without direct sunlight. This is all the more annoying for an UltraBook optimized for mobile use. This device category is to poach customers away from classic laptops just with strengths in this field. Thus, the buyer only can look for the shadiest place possible in this case. The viewing angle stability is on an average level. Like in other low-cost TN screens, the high dependency on the vertical plane is particularly problematic. 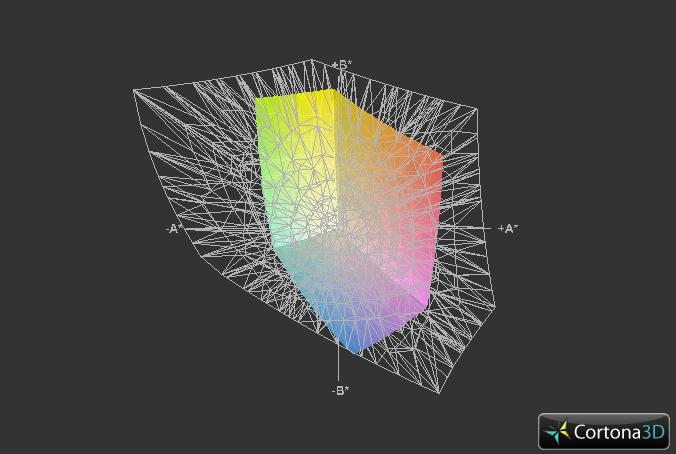 A deviation of only a few degrees up- or downward distort the color representation and reduce the contrast. The lateral viewing angles are considerably wider and allow even several viewers to look at displayed content at the same time. In our opinion, the price of about 1000€ is hardly appropriate for the overall screen's below average quality. Although it's possible to connect an external monitor via HDMI, the mobility suffers in particular from the low brightness and the reflective screen. 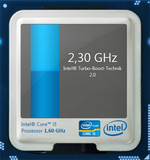 The Intel Core i5-2467M is no stranger to us. 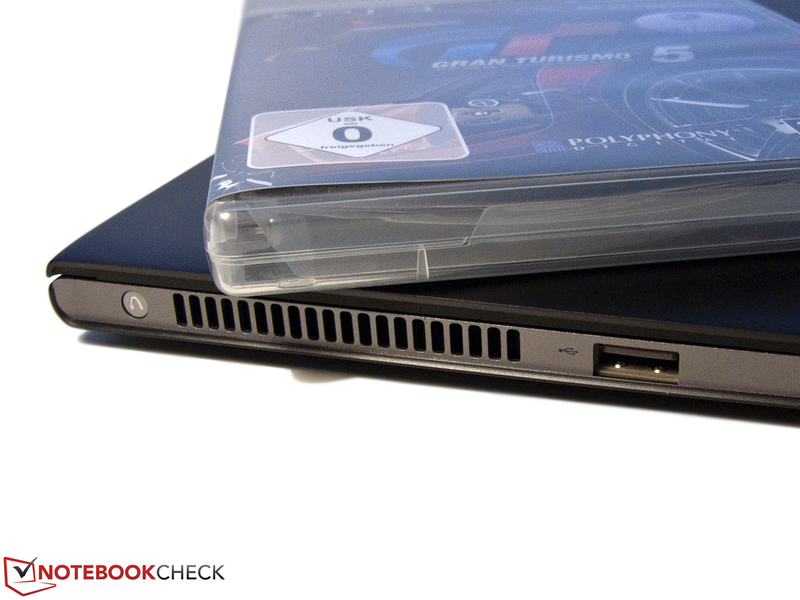 It was used in the recently reviewed Acer Aspire S3 as well as others. 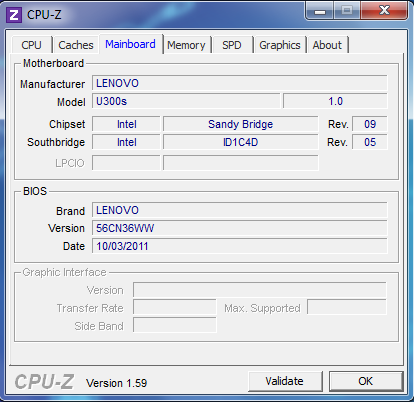 The dual core processor is based on the current Sandy Bridge architecture and has a TDP of only 17 watts as a ULV model. 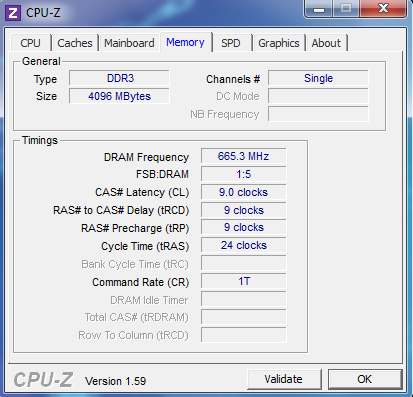 The default clock rate of 1.6 GHz can be increased to a maximum of 2.0 GHz during full load via Turbo Boost 2.0. A single core can even be boosted to 2.3 GHz. Intel's SMT technology is just as available as the instruction set, AVX, and the encryption accelerator, AES-NI. 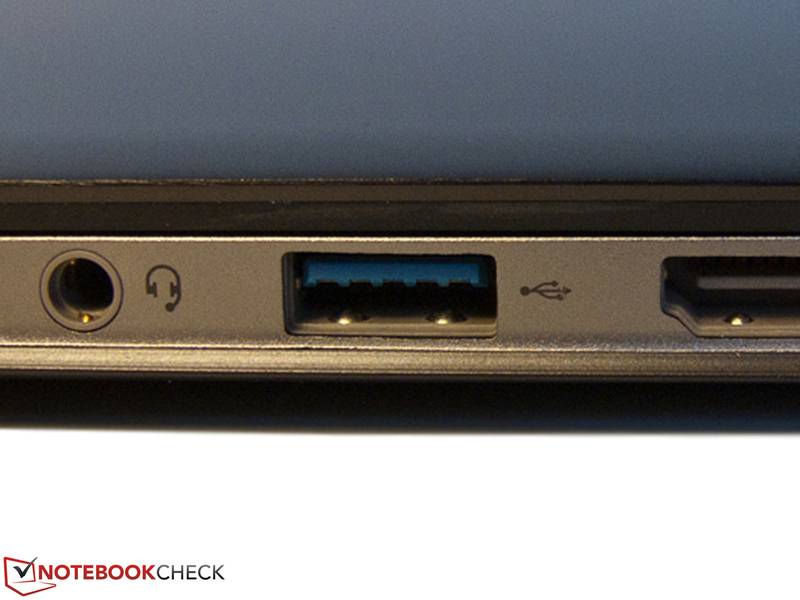 Like most other UltraBooks, the U300s from Lenovo also only uses the HD Graphics 3000 integrated in the processor. 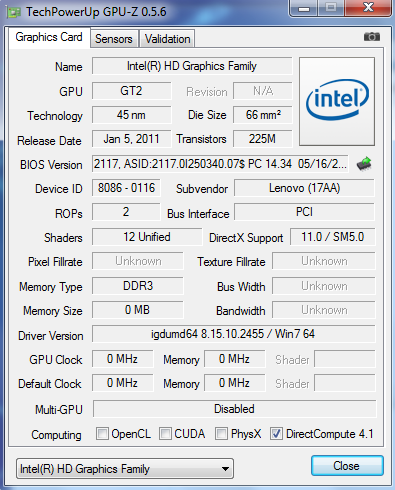 There is no additional dedicated graphics card installed. In the case of the i5-2467M, the GPU can fall back on a maximum turbo clock of 1.15 GHz, which is also very necessary due to the very low base clock of only 350 MHz. Although the performance is roughly twice as high in comparison to its precursor (GMA HD Graphics), high expectations on gaming capabilities shouldn't be set on the graphics solution. 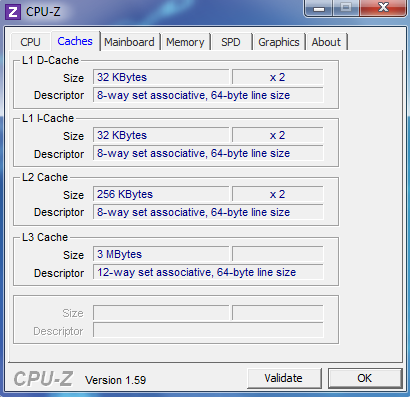 Both the processor unit and graphics module use the shared 3MB L3 cache via a ring bus. 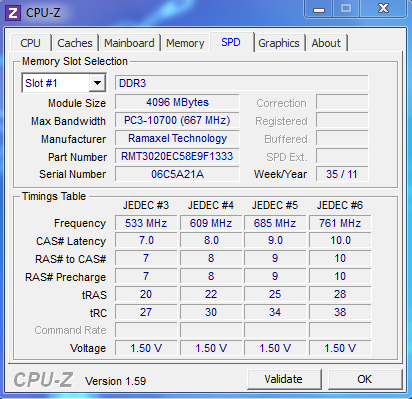 The memory controller supports DDR3 up to 1333 MHz and has been equipped with a 4GB module. Alike the 128 gigabyte SSD from JMicron, all components are built-in and can't be exchanged by the user. 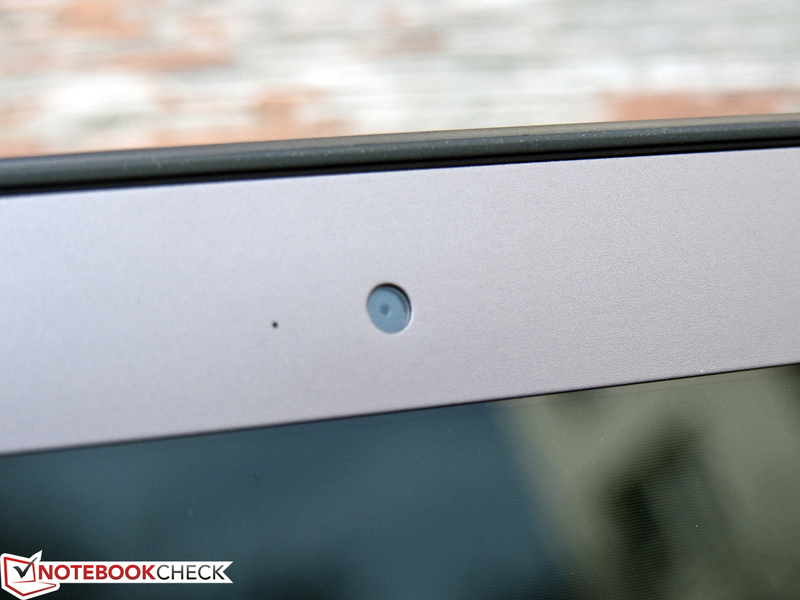 There are no visible screws on the case which would enable opening it. 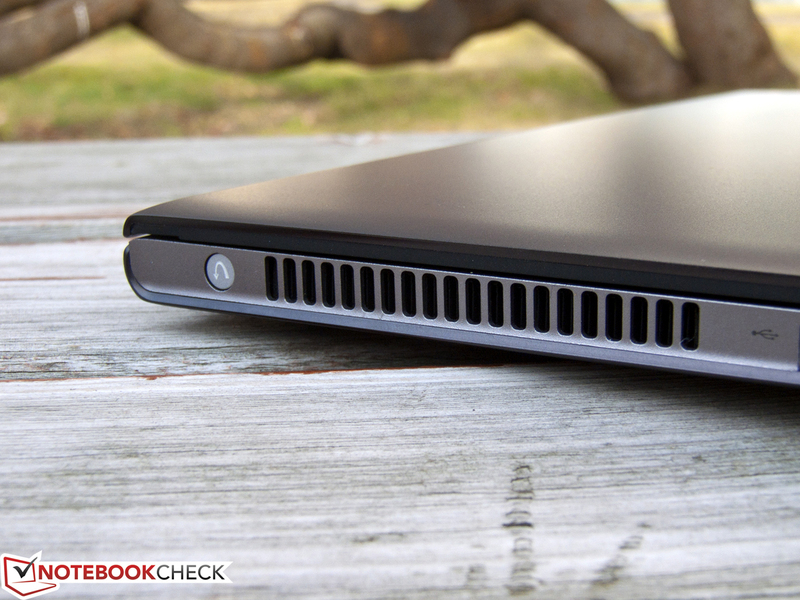 The Core i5-2467M achieves its known good performance in both battery as well as AC mode. With 3505 points in the single thread test, Cinebench R10 64 bit, the U300s manages a result that is in line with the Aspire S3 with the same processor. 7023 points are possible when all 4 threads are calculating. Thus, the energy efficient ULV processor is nearly on a par with the Core i3-2310M, which has a twice as high TDP of 35 watts. A run with the newer Cinebench R11.5 resulted in a score of 1.91 points. The Core i7-2677M in the U300s' top configuration supplies even more performance and has the lead on the i5-2467M by about 10 to 30%. 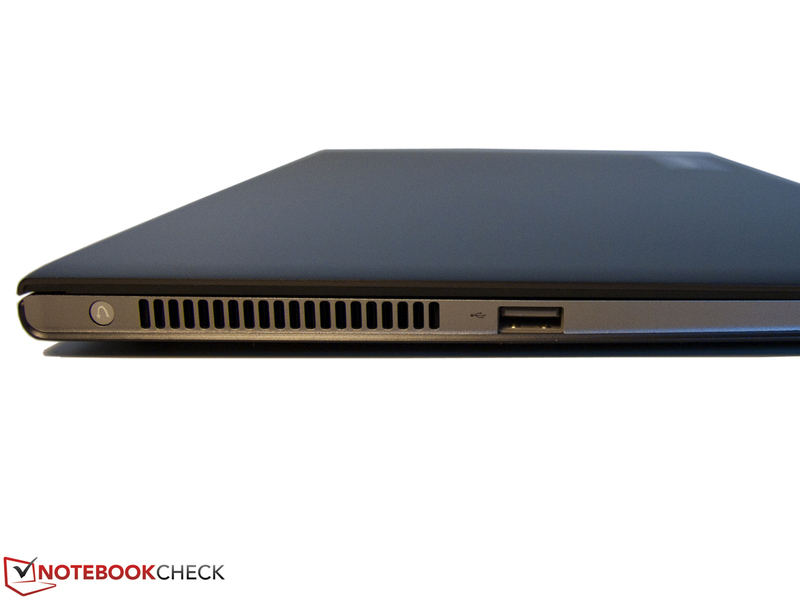 Our entry-level model is sufficiently fast for the application field of an UltraBook. No matter if surfing on the Internet, office programs or the occasional picture or video editing task, the U300s has enough performance reserves for both recreational and routine tasks. The dedicated Quick-Sync unit of the processor is also available for encoding video material. It does its job quickly and energy efficiently. Unfortunately, our test device showed an irregularity in the CPU performance when the battery was being recharged at the same time. The processor stayed at its idle clock rate of 800 MHz up to a charge state of approximately 85% even during load. We didn't record any such irregularity during discharging. The CPU also supplied its usual performance in AC mode when the battery was fully charged. We couldn't yet clarify whether this is a bug or an intended prioritization for charging the battery as fast as possible. 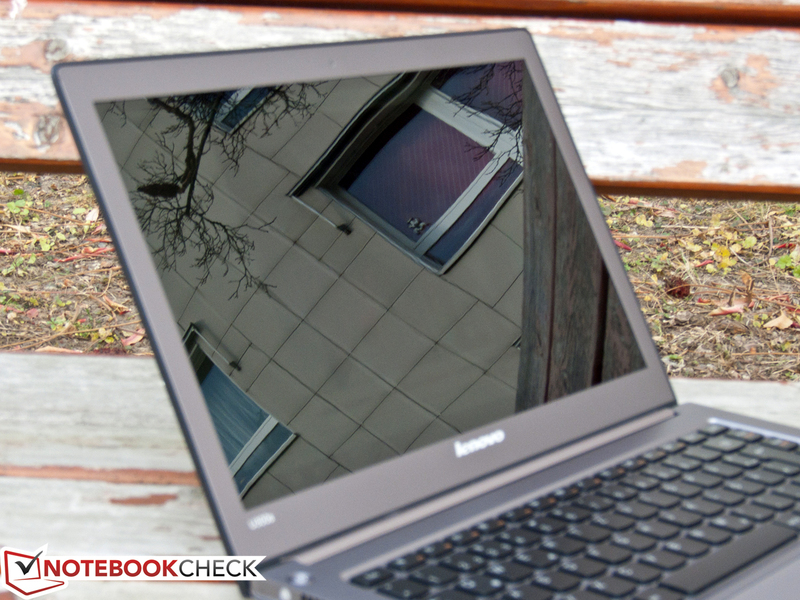 We will keep our readers up to date as to what Lenovo says about this issue. Lenovo surprises us by using a 128 gigabyte SSD model from the manufacturer JMicron. This company usually only builds the controller and isn't known for particularly efficient products. The integrated JMF616 chip is already well over a year old and had to surrender to the competition from Sandforce or Intel at the time. The sequential transfer rates of the memory connected via SATA II are quite interesting at first. The drive is in the midfield of current solid state drives with rates of up to 242 MB/s in read and 153 MB/s in write in the AS SSD benchmark. Shortcomings become particularly evident when smaller files are accessed simultaneously. 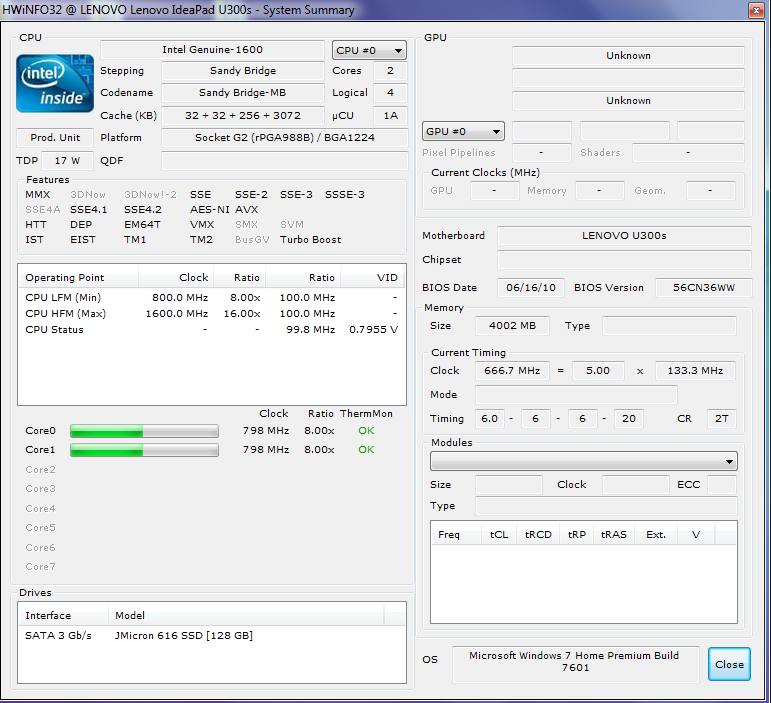 The JMicron 616 only achieves 45, respectively 18 MB/s in the 4K 64 Thread test. In contrast, the Zenbook UX31 (ADATA XM11, SandForce-SF-2281-Controller on SATA III) can excel with over 112, respectively 148 MB/s. Just the performance with small files is often especially important in everyday life and the U300s isn't quite at the highest level in this field. 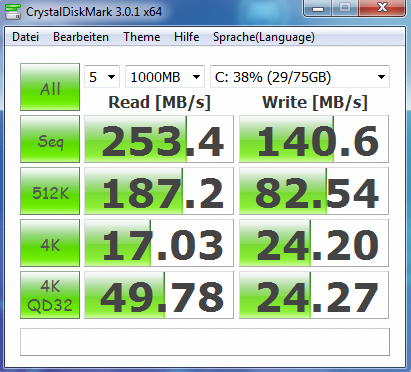 In contrast to a mechanical hard disk, as in the Aspire S3, the drive from JMicron is exceptionally fast. An access rate of about 0.26 milliseconds may not be a top rate for an SSD, but can easily beat the nearly 20 milliseconds of an HDD. The system performance of the U300s benefits especially from the built in SSD. 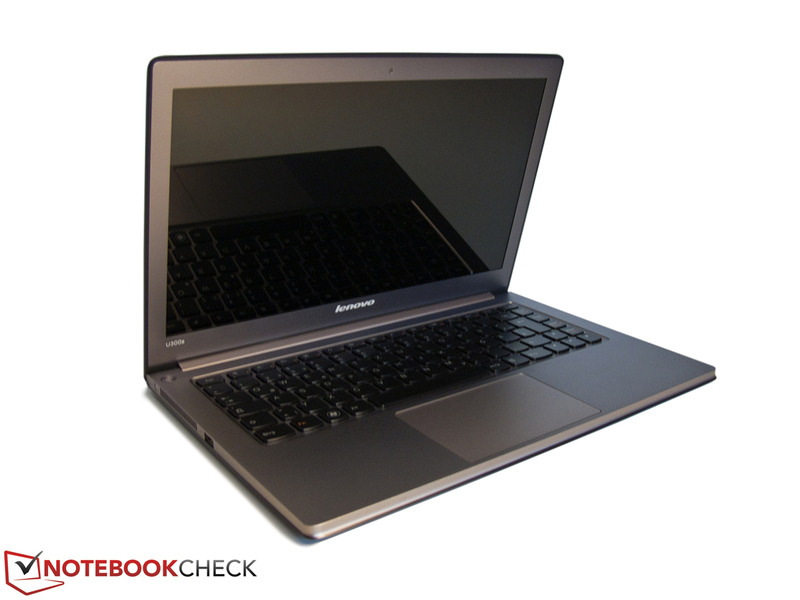 Lenovo's UltraBook lags slightly behind the competition from Asus or Samsung with 7908 points in PCMark Vantage and 3110 points in PCMark 7. 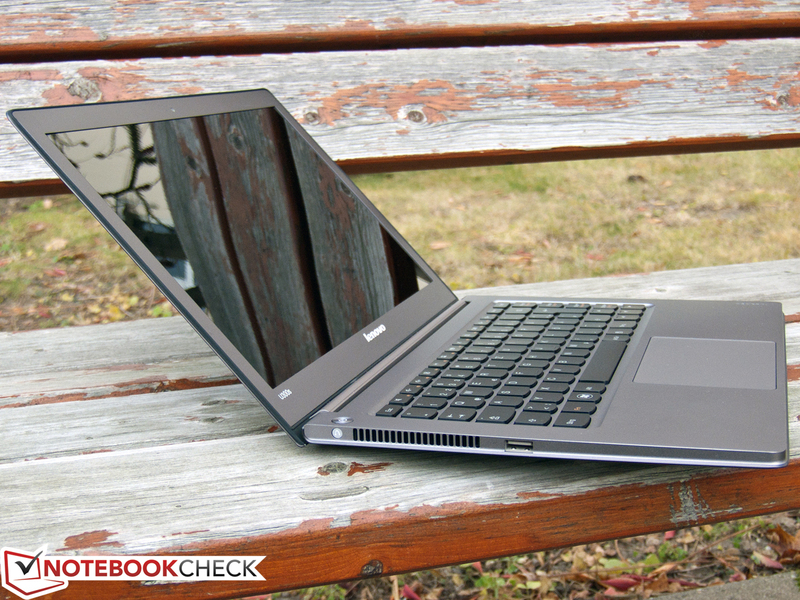 However it can clearly surpass the lower-priced Acer Aspire S3 without an SSD. The subjective speed could also convince us. 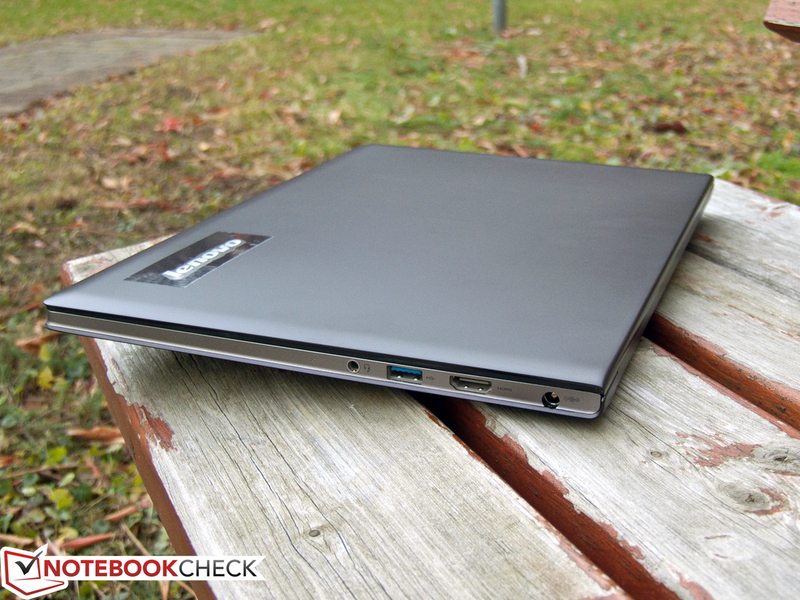 The U300s is one of the fastest ever reviewed notebooks with a system start of only 15 seconds. The log-on screen even appears after only two seconds from standby. Despite the processing power, the user frequently has the feeling to actually be sitting in front of a much stronger notebook or DTR. The IdeaPad only can't conceal its ULV hardware in processor-heavy or graphics-heavy applications and falls behind a bit. The HD Graphics 3000 is currently the fasted integrated graphics chip from Intel. With a core clock of up to 1.15 GHz, the ULV chip's graphics solution lags behind the standard models, which have a maximum of 1.3 GHz, by only a few percent. Nevertheless, the GPU delivers a very modest performance. With 3278 points in 3DMark 06 and 1478 points in 3DMark Vantage (performance presetting), the HD 3000 is at most on a par with older, dedicated entry-level models, such as the Mobility Radeon HD 5470. The latest 3DMark 11 doesn't even start due to the lack of DirectX 11 support. The U300s hardly differs from its rivals in this point. No matter if it's Acer, Asus, Apple or Samsung: All previous UltraBooks rely on the processor graphics in the Sandy Bridge CPU. At least the performance is consistent in battery mode and isn't throttled even further. In view of the graphics solution's low performance, we limited ourselves to two up to date games. 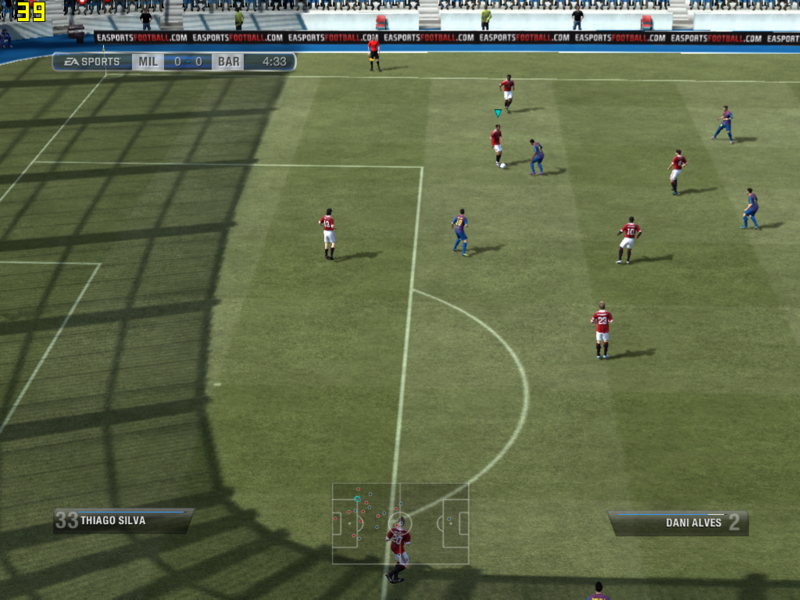 Fifa 12 has proved to be quite hardware-friendly in the past and runs just still smoothly in high details, full screen resolution and 2x AA with an average of 27.8 fps. 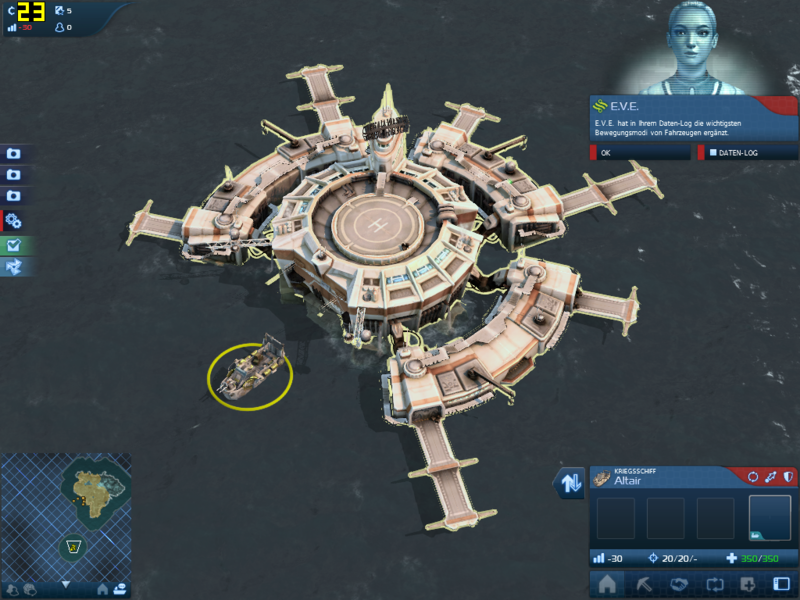 We had reduce the detail level to minimum and the resolution to 1024x768 pixels in Anno 2070 to play the building strategy game smoothly with 30.6 fps. 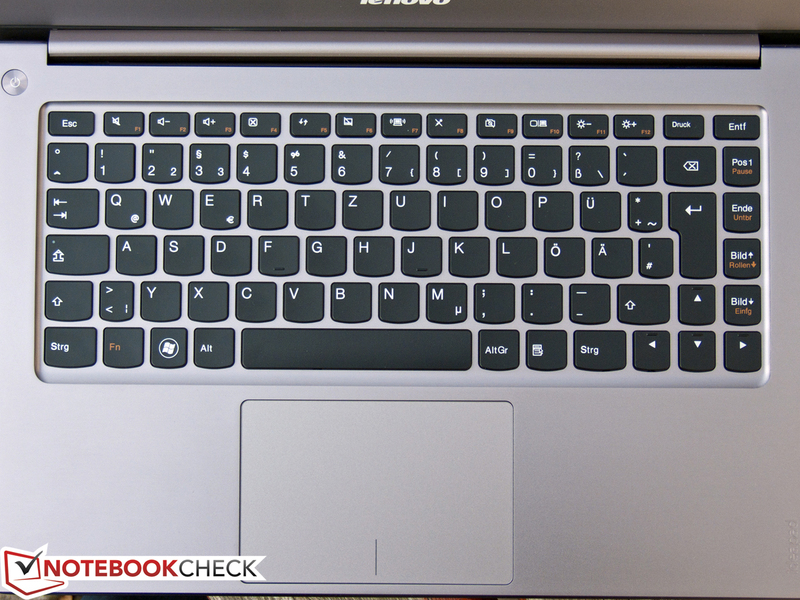 Both results are on the same level as other UltraBooks, such as the Asus Zenbook UX31. The buyer had better look around for a laptop with a dedicated graphics card should he be intending to play newer games. However, older games are displayed smoothly in most cases. 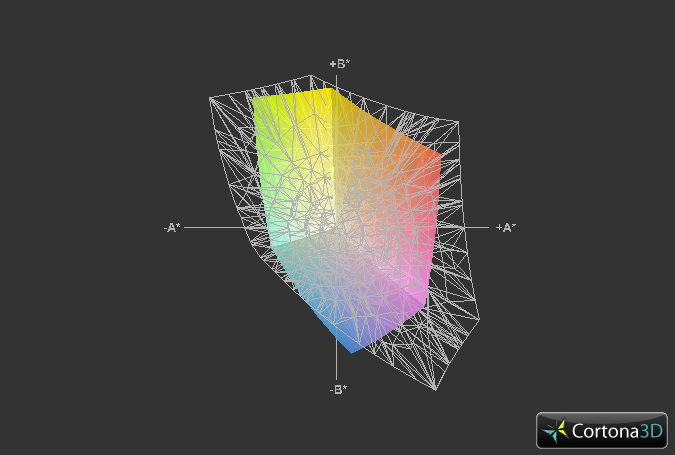 Nevertheless, quality enhancing features, such as antialiasing, should generally not be used. There are a few exceptions, though. The U300s is a pleasantly quiet contemporary. Although the fan runs permanently, the device is never disturbingly loud in idle with 30.6 to 31.4 dB (A). 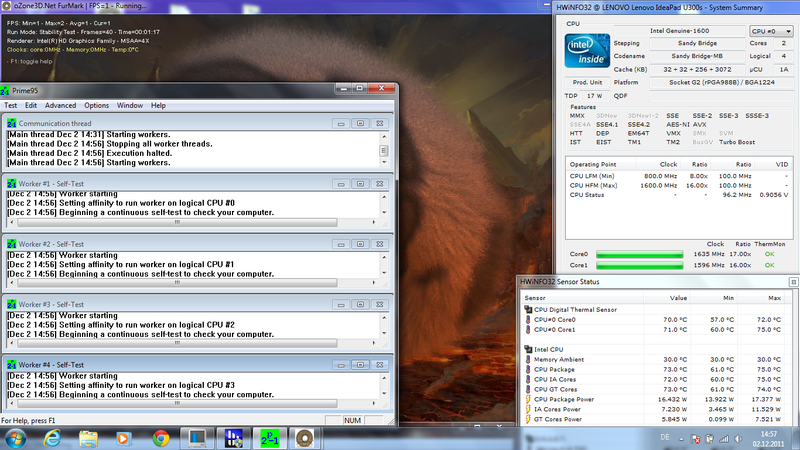 Hardly anything changes about that during routine load, even when a bit more is demanded from the processor. Noises caused by accessing the data carrier have been completely eliminated thanks to the built-in SSD. The noise level increases to 35 dB (A) when we use heavier load induced by Prime95 and FurMark. A maximum of 31.5 dB (A) are reached in practical use. Thus the IdeaPad and the Zenbook UX31 are the quietest devices in this category. The 900X3A and the MacBook Air, as well as the Aspire S3 are much more audible during load. 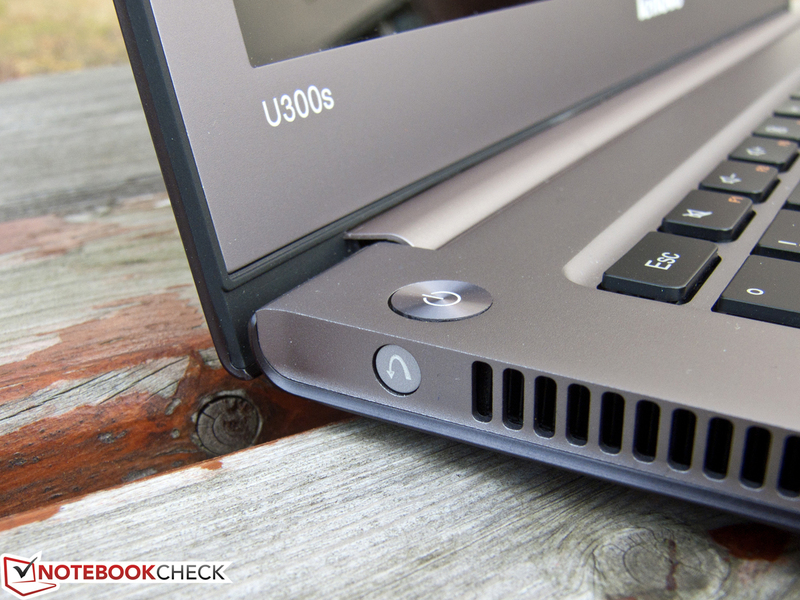 Lenovo has developed an innovative ventilation system for the U300s to make the UltraBook's low height possible. Instead of taking in the fresh air over the case's bottom, as common, the air streams into the device via the keyboard. In view of the low noise development, the cooling works quite efficiently and ensures case temperatures of only 24 to 31 degrees Celsius in idle. The temperatures increase to about 44 degrees Celsius during full load, whereby in particular the areas on the front and rear get especially warm. Two factors make this rate rather unpleasant during practical use, although the temperatures don't seem unusually high compared to other notebooks. First: The air intake over the keyboard is noticeable by a clear heat flow here and can get objectionably warm during high load. The second relates to the U300s' metal case: The high thermal conductivity of the used aluminum causes temperatures of 40 degrees Celsius to subjectively feel a lot warmer, as is the case with plastic. The Core i5-2467M stays cool even during the two hour load with Furmark and Prime95. A maximum of 75 degrees Celsius is an uncritical rate, which even has leniency for use in higher ambient temperatures. We didn't determine throttling. 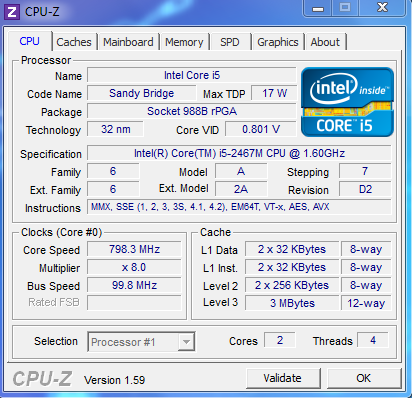 Contrarily, the first stage of the turbo mode even remained active with 1.7 GHz. Only loaded with Prime95, the processor added another 300 MHz and ran stably with 2.0 GHz. A subsequent run of 3DMark 06 didn't show any performance losses. The stereo speakers, invisibly hidden behind the keyboard, convince with a very clear sound and good maximum volume. High and mid ranges are rendered cleanly and voluminously. The subwoofer-less U300s only shows weakness in the bass range. 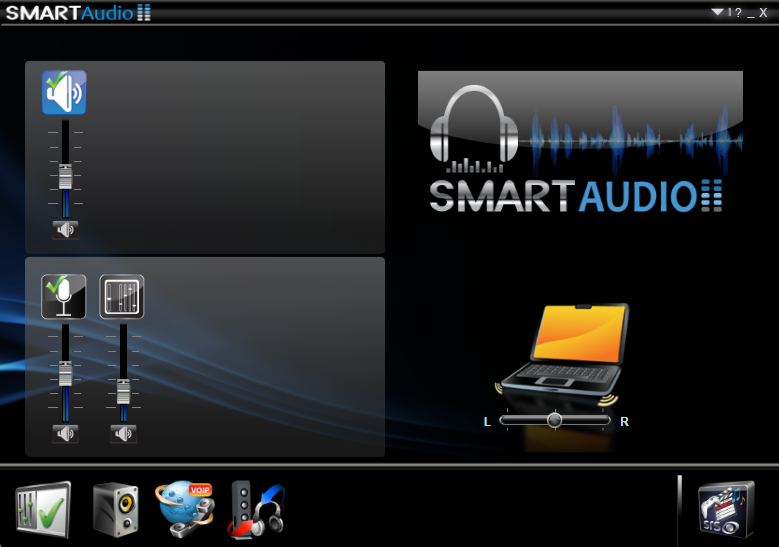 In relation to the UltraBook's compact build, the sound quality is very good. For best playback, it is advisable to connect the home stereo system via HDMI. Older receivers without the corresponding in as well as headphones can also be connected via the 3.5 millimeter jack. Equipped with efficient ULV hardware, the U300s proves to be modest in terms of power consumption. We measure a minimum consumption of 7.6 watts in idle, which is only marginally over that of the competition, such as the Aspire S3 (6.5 watts). The power consumption climbs to 31 to 35 watts, which is also a good rate for this device category. 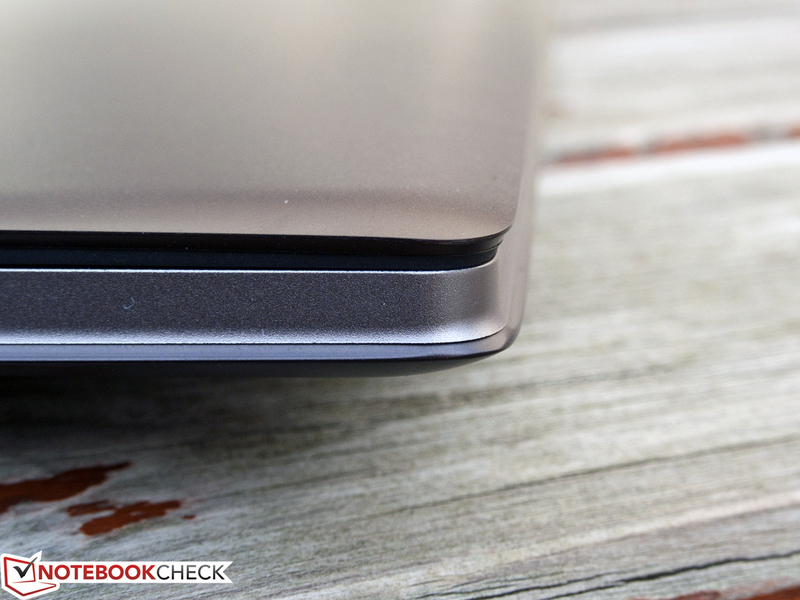 Merely the MacBook Air steps out of line with considerably higher rates of up to 48 watts. The included 65 watt power adapter has enough power reserves and stays extremely cool with a maximum of 42.7 degrees Celsius. The built-in 4 cell battery of the U300s has a power capacity of 54 watt hours. This is a bit more than in the UX31 (50 Wh) and is much higher than that of the Aspire S3 (38 Wh). Nevertheless, Lenovo's UltraBook only reaches a runtime of not quite 7 hours in Battery Eater's Reader's Test, and thus clearly fails the manufacturer's specification of a whole 8 hours. We disabled all wireless connections, reduced the screen's brightness to minimum and used the energy saving profile in this scenario. 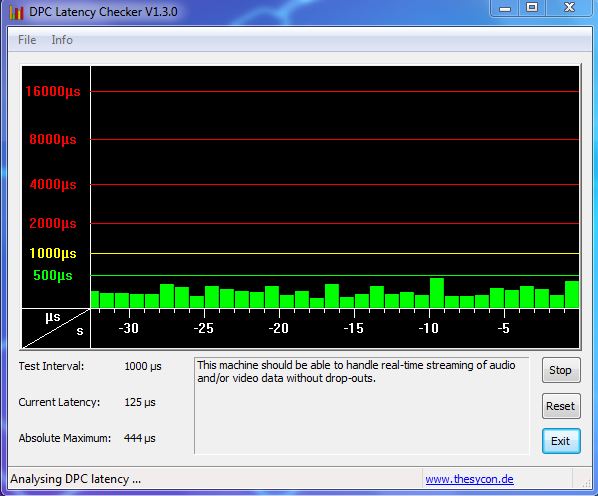 Our WLAN test is more significant for practical use. Here we achieved a good result of over 5 hours. Interestingly, the UX31 from Asus can also take a slight lead here, although it has a somewhat stronger CPU and a smaller battery. Finally, we determined the battery life in full load with Battery Eater's Classic Test. The user has to look for an electrical outlet after good two hours when WLAN and maximum brightness are enabled. The contenders from Acer, Asus and Apple have set a fast pace in the last few weeks and months - in particular the Zenbook UX31 and the established MacBook Air could impress us with their advantages. 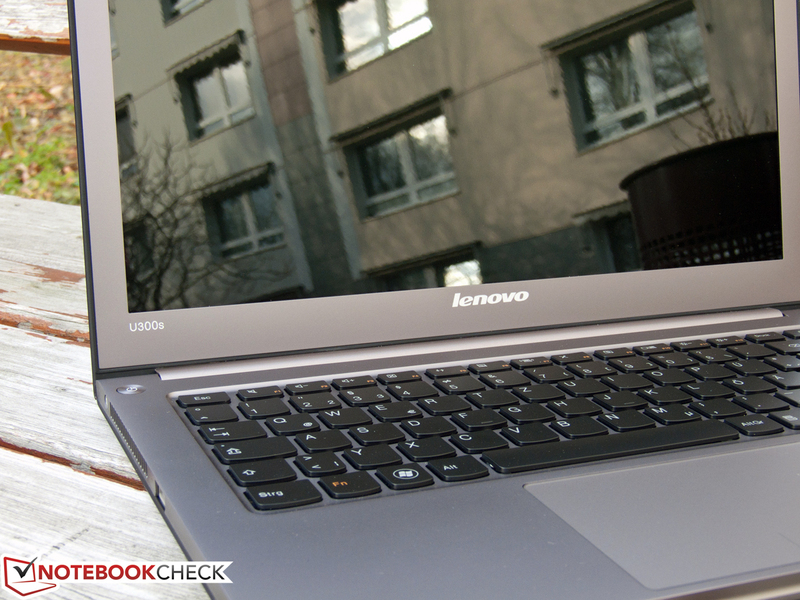 Now, Lenovo has also sent its candidate, the U300s, into the ring with several strengths, but also a few weaknesses. 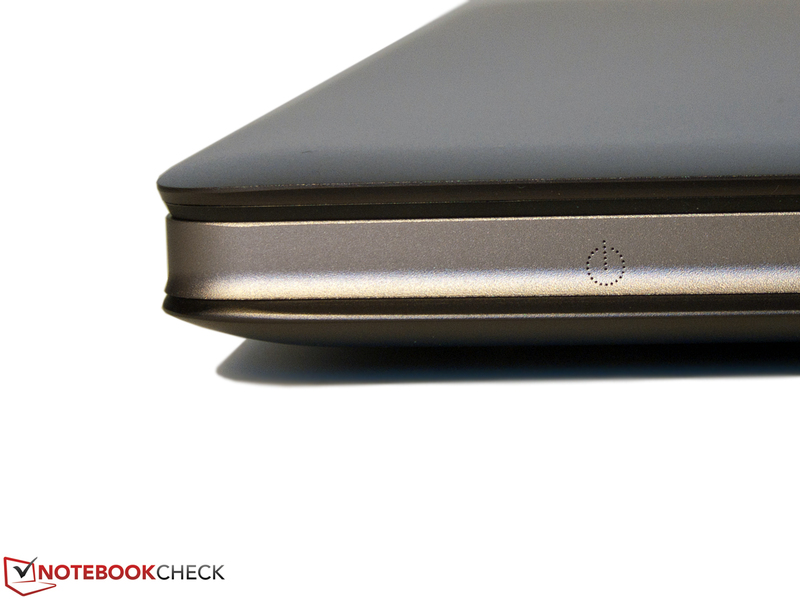 The UltraBook is inspiring right from the first moment with its elegant and incredibly slim design. The workmanship of the aluminum chassis can easily keep up with the unibody case from Apple, but has to regrettably accept a few deductions in stability. Also, there is room for improvement on the somewhat loose and clearly wobbly display hinges. The screen is only suitable for outdoor use to an extent. The backlight is too dark and, alike most competing products, the surface reflects intensely. We could only say words of praise about the subjective and assessed performance thanks to the Core i5-2467M and the built-in SSD. However, Lenovo has seriously blundered with the battery's charging electronics: When the battery is being recharged, the CPU throttles to its idle clock rate and unpleasantly slows the UltraBook down for about 1.5 hours. The afterward long battery life can only make up for that to an extent. Because we can't completely rule out a malfunctioning of our test device, we will keep our readers informed about the manufacturer statements on the issue. Every buyer has to decide to what extent the listed shortcomings can be accepted at a price of 1000€ for himself. 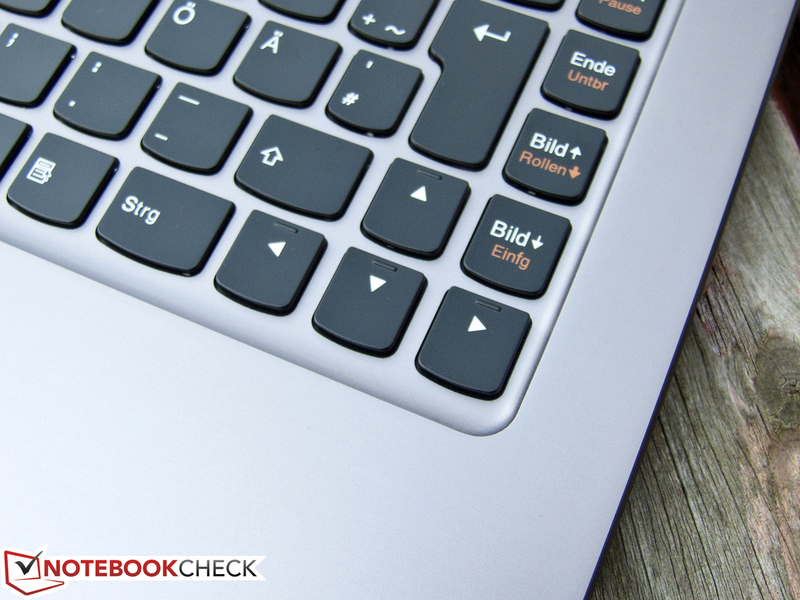 Our recommendation would be the recently reviewed Asus Zenbook UX31, which bids a brighter screen, stronger hardware and a more balanced total package at about the same price. The comparison with a DVD cover is impressive. ...no matter how it's looked at! but could offer a bit more. but could use a stronger backlight. takes in fresh air via the keyboard. The CPU throttles when charging the battery despite a strong 65 watt power adapter. Design is a matter of taste, but the U300s' slim aluminum case is undoubtedly exceptionally elegant and perfectly manufactured. 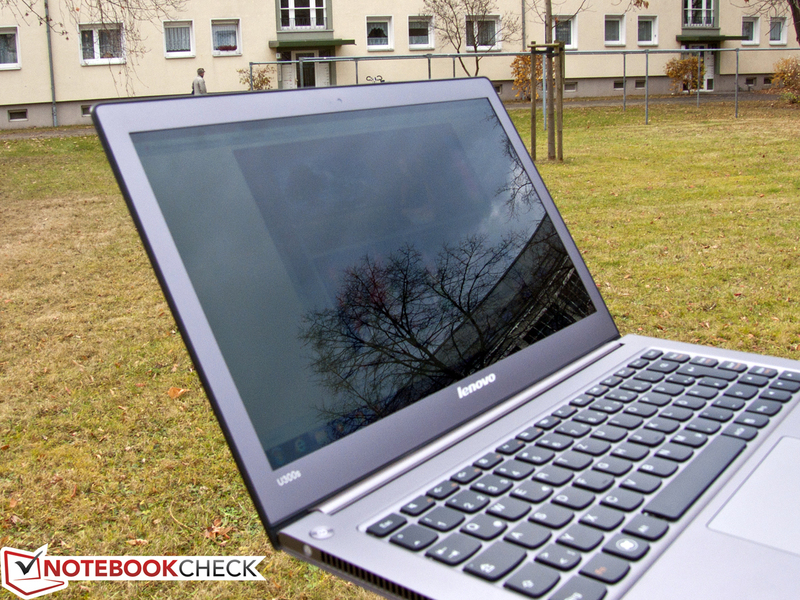 Doesn't weigh even 1.3 kilograms, has a thickness of under 15 millimeters and a long battery life - Lenovo's UltraBook has the best requirements for a high mobility. If it weren't for the dark and intensely reflective screen, which is absolutely unsuitable for outdoor use. 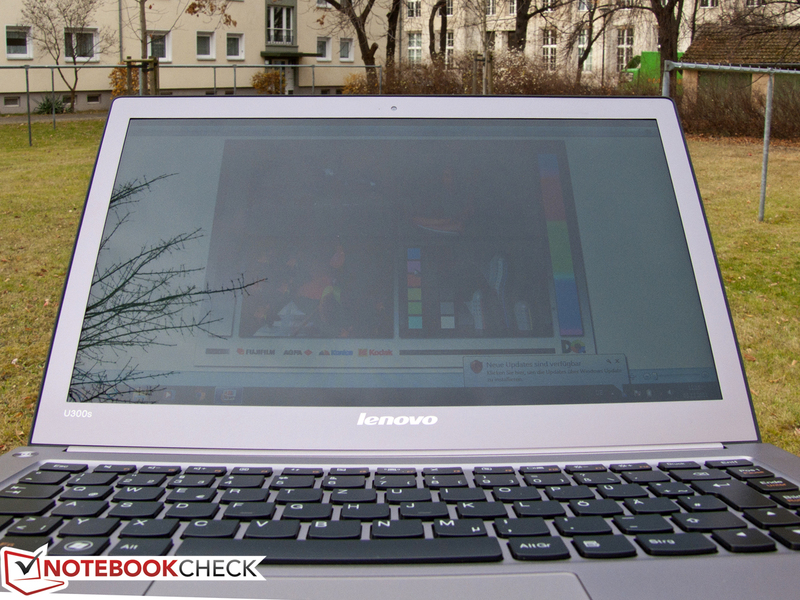 UltraBooks, such as the IdeaPad U300s, excel with an impressive feeling of speed despite ULV processors. It has sufficient performance reserves for many application fields, which make bigger and stronger notebooks unnecessary. The U300s faces the Zenbook UX31 from Asus, the Aspire S3 from Acer and the leader of the 13.3 inch category, Apple with its MacBook Air. Has been around longer on the market: The Samsung 900X3A with the likely best screen in this category.